(2001-09-14) I am still shocked by the events of last tuesday. When we first heard about two planes having crashed into the World Trade Center in New York, we couldn't believe it. We hoped it was a bad joke. But it wasn't. But let's not forget about freedom of speech. A lot of people are concerned that government agencies will use this event to further their goals of total surveillance - I have mixed feelings about those - which is not a good thing in itself. Already, there is violence against arab people in the united states (at least, that's what TV tells me), which is guaranteed to hit the wrong people. The terrorists are a small minority. If we start civil war, the terrorists win. (2000-07-12) The current (and most reliable) release is Dreaming Of Brazil 3.0 b6 -- it will keep its beta status until I have a better solution for the device driver. This version fixes SmartMedia support for the newer Rio PMP 300 models that have only two internal flash chips (the old model had 4 8MB chips, the new one has two chips with 16MB each, thanks to Scott for reporting the problem). Another longstanding bug was the handling of directory names that was screwed up for names shorter than 2 letters (and cannot have worked for C:\ either). The file "readme.txt" contains Release Notes and Troubleshooting Hints. You might want to read it, since it is all the documentation I have. This file is also displayed by the installer and installed along with the application. I would appreciate to read about any problems (or successes) you've had with the software. Please write to rio@parkverbot.org. I definitely need a new layout for this page -- if you have a good idea as well as spiffy graphics, let me know. If you are looking for support for the Rio 500, drop me a note -- I am trying to find the time to do it, a lot of people have already expressed their interest. I just (2000-07-13) downloaded Andy's source code at http://www.evilaliens.com/Rio500Remix.htm and will try to derive a first version of DoB in the next few days. The source code is available as well. You will need Borland C++ Builder (for the GUI part), Visual Studio 6 and the NT/2000 DDK (for the driver / DLL) to compile it. Don't blame me if it doesn't work, tell me instead what goes wrong. It can initialize your Rio pretty reliably, it may even rescue your Rio after you have formatted it with another Rio Manager for NT. There may be problems or strange effects. I had e.g. the effect that searching backwards catapulted me into another track after a slight pop that didn't belong to the track. I am still researching what causes these problems, I would really appreciate any feedback concerning this kind of problem, ie. I would like to know whether you have these problems, too, and, what your configuration is. Sometimes reconfiguring your parallel port to EPP mode may make problems go away. Please try your BIOS's settings for the parallel port before reporting transmission errors. Dreaming of Brazil supports SmartMedia Cards and lets you restore the SmartMedia headers so you can use the card in your camera again. (And they told you it couldn't be done...). There is a tool by Diamond/S3 that does the same and may be more reliable, look for "riodiag.exe" in their download area. Please make sure you understand that this is copyrighted OpenSource Software that is published under the GPL (Gnu Public license). If you fry your cat with it or destroy your marriage, I can't be blamed. If it works though, you are required to be happy and enjoy the experience, if you don't, you must uninstall everything or hack the source (see above). If you are very happy with the software and need to send me a gift, try my Amazon.de wishlist (it's in german, unfortunately). Guido March found out how the SmartMedia cards work. See his site for more information about the Rio's inner workings. All code for the communications between the PC and the Diamond Rio is taken from the Snowblind Alliance - but don't blame them if it doesn't work, I have hacked it quite a bit to my liking. The current Snowblind code doesn't support newer Rio 300 models, as far as I know. If you bought your Rio 300 just recently this might be an issue for you. My code should be much faster as well. 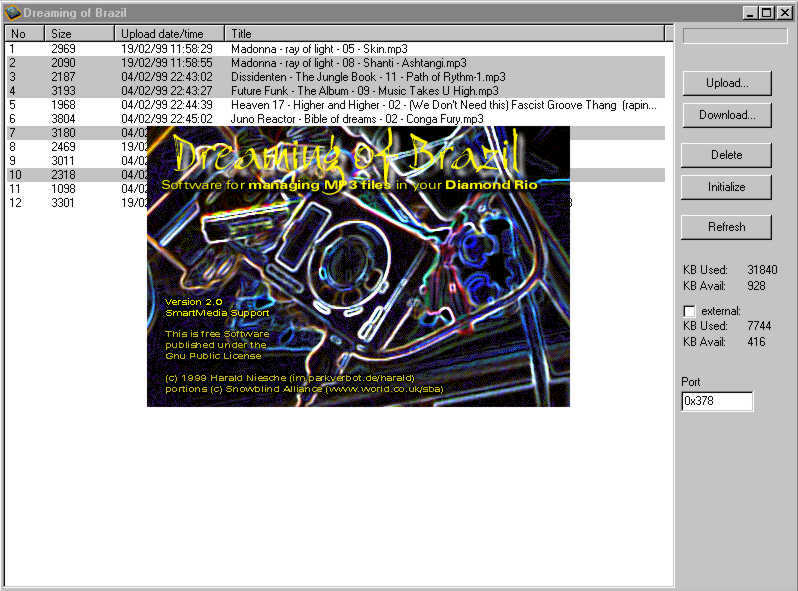 A screenshot of the application with part of the list of songs currently in my Rio.